Joe Fontes used more than his thumbs to haul in a 46-yard TD pass from teammate Noah May with 16.2 seconds left that lifted bubble team St. Mary’s of Stockton past Sheldon of Sacramento 30-29 in CIF Sac-Joaquin Section D1 playoff game. The Rams, who have to play No. 5 Folsom next week, escaped going to overtime when Eddie Sanchez made a 35-yard PAT after Fontes’ touchdown to break a 29-29 tie. Sheldon ends the season 10-2 with its only other loss to unbeaten Monterey Trail. St. Mary’s improved to 8-4. Photo: Mark Tennis. This post has been updated after Saturday games and includes additional postponements. It was hard not to be distracted by the difficult events throughout the state heading into the weekend, but most CIF section playoff games were played with some having to be postponed due to smoke in the Bay Area from the Camp Fire raging near Chico and other games impacted by the chaos of the Woolsey Fire near Malibu. The closest result that could be called an upset was No. 22 Norco falling to Upland. The big boys all won resoundingly, including No. 2 Corona Centennial and No. 3 Mater Dei, who collide with each other in next week’s CIFSS D1 semifinals. Defeated No. 24 San Clemente 56-6. Described by San Clemente head coach Jaime Ortiz as the best team he has faced in 26 years. CIF Southern Section D1 quarterfinals. Playing Oaks Christian (won on Saturday) semifinals next week. Defeated No. 37 Rancho Cucamonga 58-20. CIF Southern Section D1 quarterfinals. Sets up monster semifinal next week vs. No. 3 Mater Dei. Trent McDuffie gets some congratulatory treatment after one of the his TDs for No. 1 St. John Bosco in impressive win vs. No. 24 San Clemente in CIFSS D1 playoffs. Photo: @BoscoFootball/ Twitter.com. Defeated No. 11 Mission Viejo 56-17. CIF Southern Section D1 quarterfinals. Diablos were ahead 10-7 but didn’t matter. Monarchs playing Centennial next week. Defeated No. 17 Pittsburg 38-0. CIF North Coast Section Open Division semifinals. Dorian Hale had 86-yard TD pass to Lu-Magia Hearns plus a 24-yard TD run in first half. In second half, Shamar Garrett had TD run and threw option pass TD to Grant Daley. Defeated Edison (Stockton) 64-28. Folsom led 50-0 after one quarter and the starters were pulled before the beginning of the second quarter. CIF Sac-Joaquin Section D1 quarterfinals. Defeated No. 7 JSerra 35-34 on Saturday in game that was postponed from Friday due to wildfires in Oaks Christian areas. CIFSS D1 quarterfinals. Garth White kicked 26-yard field goal with 18 seconds left for winning points. LOST to No. 6 Oaks Christian 35-34 at home on Saturday. CIFSS D1 quarterfinals. Lions and fans should be saluted for free pre-game tailgate offered to Oaks Christian fans earlier. Plays No. 25 Clayton Valley (Concord) Monday in NCS Open Division semifinals. Game originally scheduled for Saturday but postponed due to poor air quality from Camp Fire in Butte County. Winner faces De La Salle in two weeks. Defeated Edison (Fresno) 42-21. CIF Central Section D1 quarterfinals. Edison lost to Grizzlies 35-7 earlier, but were tied at 21-21 in this game before Quali Conley scored on 41-yard TD run and caught 43-yard TD pass from senior QB Trent Tompkins. Game vs. Aragon (San Mateo) now postponed to Monday (orginally Friday, then Saturday) due to poor, smokey air in area from NorCal wildfires. CIF Central Coast Section Open Division 2 playoffs. LOST to No. 3 Mater Dei (Santa Ana) 56-17. CIFSS D1 quarterfinals. No team probably outside of the top five would have probably done any better against the Monarchs. Defeated San Marcos 35-28. Mac Bingham had 201-yards for Torrey Pines, which trailed at one point 28-14. CIF San Diego Section Open Division semifinals. Defeated No. 45 Carlsbad 35-0. CIF SD Sec Open Div. semifinals. Dons are facing Torrey Pines in two weeks for the title and likely spot in CIF SoCal D1-AA regional bowl game. Shawn Poma had TD runs of 61, 20 and 38 yards in the win. Defeated Venice 67-0. CIF L.A. City Section Division I playoffs. It was 43-0 at halftime as Gauchos rolled once again. They’ll now play Birmingham of Lake Balboa in semifinals. Defeated San Juan Hills (SJ Capistrano) 41-20 in game played Saturday. Wildfires in Calabasas area caused Friday game at San Juan Hills to be postponed. CIFSS D2 quarterfinals. Cam Davis had some big runs for Upland in 33-28 victory against Norco in the CIFSS D2 playoffs on Friday. Photo: Twitter.com. Season complete. Lancers lost last week to No. 11 Mission Viejo in CIFSS D1 playoffs. LOST to No. 4 De La Salle (Concord) 38-0. CIF NCS Open Division semifinals. Pirates trailed 17-0, but had long drive to start second half that could have made it interesting but they didn’t score. Defeated Arroyo Grande 48-17. Central Sec D1 quarterfinals. Kendall Milton found the end zone three times for the Bears, including a longest TD run of 62 yards. Defeated Saugus 32-15. CIFSS D4 quarterfinals. Spartans will now play Grace Brethren of Simi Valley in a great matchup. Corona del Mar is still going as top seed on other side of bracket. Defeated No. 47 Alemany (Mission Hills) 42-14. CIFSS D2 quarterfinals. For the first nine games, the Mustangs didn’t have to do that much to go unbeaten. But wins against Heritage, Tesoro and now Alemany have been more impressive. Season complete. Lancers lost last week to No. 2 Corona Centennial in CIFSS D1 playoffs. LOST to No. 41 Upland 33-28. CIFSS D2 quarterfinals. Tough loss may motivate team with a lot of top underclassmen when they start to look at next season. Defeated Elk Grove 49-7. Sac-Joaquin Section D2 quarterfinals. It wasn’t that long ago when Elk Grove was near the top of the SJS in D1 and Central Catholic was primarily regarded as a small school powerhouse. LOST to No. 1 St. John Bosco (Bellflower) 56-6. CIFSS D1 quarterfinals. Playing No. 8 Liberty (Brentwood) on Monday in NCS D1 semifinals. This game initially scheduled for Saturday and always was supposed to be Saturday. Delayed from poor air quality. Defeated Paraclete (Lancaster) 76-40. Jayden Daniels becomes all-time passing leader in Southern Section. Had 396 passing yards and rushed for 156 yards. CIFSS D3 quarterfinals. Game scheduled vs. Encinal (Alameda) postponed to Monday. NCS D3 playoffs. Defeated Yorba Linda 49-12. CIFSS D3 quarterfinals. Defeated Tracy 36-7. Sac-Joaquin Sec D2 playoffs. Defeated Oceanside 27-7. San Diego Sec D1 playoffs. Defeated Paramount 41-12. CIFSS D4 playoffs. Season complete. CIFSS D2 playoffs. Defeated Downey (Modesto) 69-29. Sac-Joaquin D2 quarterfinals. LOST to Mission Hills (San Marcos) 14-0. 13th straight time head coach Chris Hauser has led Mission Hills to CIFSD semifinal. Defeated Antelope Valley (Lancaster) 38-0. CIFSS D5 playoffs. LOST to Notre Dame (Sherman Oaks) 49-32. CIFSS D2 playoffs. Season complete. CIFSS D1 playoffs. Defeated Pitman (Turlock) 63-7. Sac-Joaquin Section D1 quarterfinals. Defeated Los Alamitos 49-32. Head coach Kevin Rooney returned to sidelines after missing one week due to death of his wife. CIFSS D2 quarterfinals. LOST to No. 2 Corona Centennial 58-20. CIFSS D1 quarterfinals. Defeated Moorpark 62-21. CIFSS D3 playoffs. Defeated Mira Costa (Manhattan Beach) 34-16. CIFSS D6 playoffs. Defeated Sheldon (Sacramento) 30-29. CIF Sac-Joaquin Section D1 playoffs. Rams now have win over previous 10-1 Cougars to go with earlier quality win vs. Bishop O’Dowd. Game scheduled for Friday vs. Christopher (Gilroy) postponed to Monday (poor air quality). CCS Open 2 quarterfinals. Defeated No. 22 Norco 33-28. CIFSS D2 quarterfinals. Game against Piedmont Hills (San Jose) postponed to Monday (poor air quality). This was originally a Friday game delayed to Saturday and now Monday. CCS Open Division 1 playoffs. Two pick sixes on Edison’s first few plays doesn’t make 50 for them in one quarter that hard to believe. And Edison is that bad and has no business being in D1 in the SJS. I don’t think a big school like that should be way down in D5 or D6 but in D4 with Rio Linda, Oakdale, etc. for sure. At least there’s some hope there for the Edisons, Staggs and similar type schools. State record is 58 pts for one quarter by Vasquez of Acton in 1999 game. Folsom’s total in top five. They also are near top but not record for most points in a half when they had 75 that one time against Vacaville. Well, if I am going to defend Central of Fresno, I also have to be critical when things are bad. They were BAD last night. The offensive line looked very shakey, the defensive backs couldn’t find the foot ball for 3 quarters, and the defensive ends were simply outblocked. Put simply, the Grizzlies looked flat, and Edison wanted it more. The maturity and drive of such a highly ranked team should be peaking right now, not falling off. 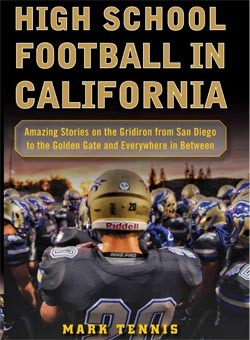 When I realized we were playing historically the winningest team in CA history (I read Marks book!) In Bakersfield next week, I honestly shuddered. We have to play to WIN, and not to PREVENT THE LOSS. That starts at the top. Kyle Biggs is the best head coach in the section, but he’s got a tough job gettin the boys ready. We cannot play like this again or its lights out. Oh, oh…Trent Tompkins saved them last night. At times he looked like the only one focused. Considering his audible calling, handing off to himself and running, passing, and fake punting, he could be an entire team unto himself. First half was not ideal, but NO one was. Well, guess the good news for you and Central fans is that there’s now nobody else left that can be moved higher in the rankings. No upsets in CIFSS D1 playoffs and St. Francis isn’t going to play anyone strong enough in its bracket to be higher. If Liberty loses tonight or loses by three TDs or more to DLS, then it’s still pretty promising for Central to not only get into the D1-AA state bracket but a game at home vs. Folsom. As you know, though, gotta turn it around and play better. Another sub-par outing and could be lights out. Sometimes peaking early happens. We’ll see. I think I want the d1A game now! Hahaha! Re: Oaks Christian vs. Jserra and Kayvon Thibodeaux‘s (#1 player in nation) late in the 3rd quarter for unsportsmanlike conduct (something verbal to the Refs after the play was dead I think). I know it’s a CIF rule to sit an ejected player the next game; however, this wasn’t your garden variety ejection for ‘unnecessary roughness’ or ‘targeting’… just seems overkill and borderline egregious. Not sure how the appeal process/timing works here…is there ANY possible chance for appeal BEFORE next week’s game vs. Bosco or any scenario that would allow KT to play next week? I don’t think so. But I also don’t think a player in a high school game gets ejected for one unsportsmanlike conduct penalty, either. Wish I was more of a rules expert. Tougher road to Open Championship this weekend? Again, they need to bring back a NorCal Open Regional Game to make equal to Southern CA winner of D1SS championship which is basically the SoCal Open Regional Game. They aren’t going to bring back a NorCal regional and not have a SoCal regional to somehow make it more fair for the CIFSS D1 winner. The CIFSS is the one that created this monster so don’t see why state or DLS or anybody else has to adjust. And to be clear, NorCal schools don’t bring in the multiple big-time transfers like is going on at the top schools in SoCal. If you want it to be more fair, let’s talk about that. Ok, so if we go down the ‘recruiting’ path- JSerra, Mater Dei, OLu, Servite and Santa Margarita are all competing within a 30 mile radius for the same kids. What state private powers is De La Salle competing with in 30 mile radius? But that is the private school world. I agree SS should kill the SSD1 monster. There is zero reason Folsom should destroy Upland in D1AA while their equal Centennial sits at home every year. It’s more than 30 miles out to Upland/Rancho Cucamonga and elsewhere for kids going to MD and Bosco for sure. And DLS actually doesn’t bring in transfers like the other two. I do see your point about Folsom rolling in D1-AA while others that would be competitive are out. The only way to really fix all of it would be to change the structure of high school sports in California (equal north and south sections with both going by exactly the same rules & bylaws) and don’t think would be enough support in the public for that.